The online configurator for the 2019 BMW M2 Competition is now live on www.bmwusa.com. 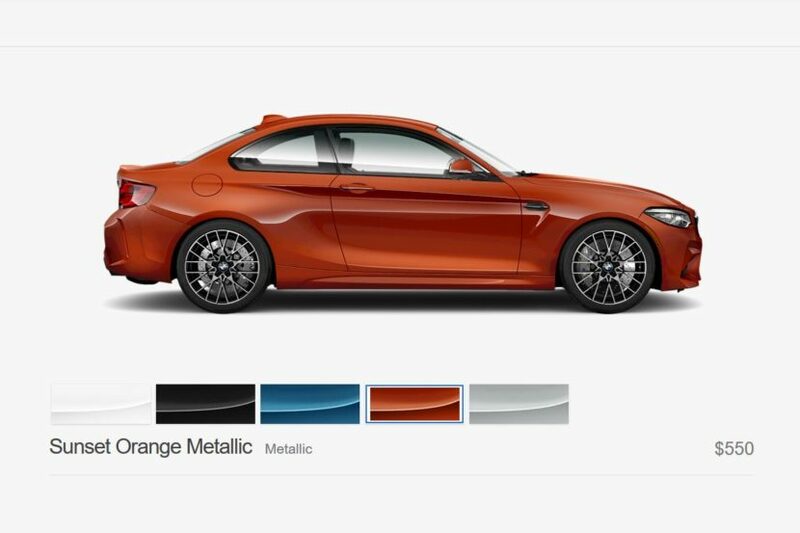 As seen in the ordering guide, the M2 Competition comes with two new exterior colors – Hockenheim Silver Metallic, along with Sunset Orange, which was previously available on other BMWs but new to the M2. There are two choices of wheels, the standard 19″ Style 788M wheels, in either bi-color or black, which look the business. M2 Competition buyers can also choose from either the seven-speed dual-clutch gearbox or a six-speed manual, which is refreshing to know that it still can be had with a proper three-pedal ‘box. Standard equipment includes the sporty looking Shadowline trim, BMW M seatbelts, a BMW M sport seat and Apple CarPlay (finally as-standard). On top of those standard features, there are some additional options and packages. There’s the Executive Package, which brings such luxuries as full LED headlights, wireless mobile phone charging and a heated steering wheel. That also brings a WiFi hotspot and automatic high beams. So it’s a nice package that’s reasonably priced at $1,200. Of course, the optional seven-speed dual-clutch gearbox is also available, at the price of $2,900. The M2 Competition for US customers comes standard with the M Sport Brakes kit.